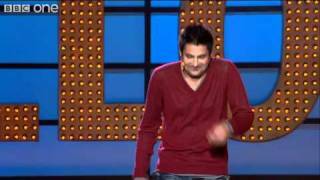 Born in the Scottish spa town of Moffat, Danny Bhoy began stand-up in 1998, soon after completing a history degree. He said he caught the comedy bug after walking past an Edinburgh pub and hearing a commotion inside. He discovered it was an open-mic comedy night in progress, and from then he was hooked. Within his first year, he won The Daily Telegraph Open Mic Award, and in 2000 performed as part of the Comedy Zone showcase of up-and-coming stand-up talent at the Edinburgh Fringe. The following year, he performed his first solo show at the festival, and has returned every year since, except 2007. He has also become a regular at several international festivals. He made his debut at the Melbourne Comedy Festival in 2003 and in 2005, he was invited to both Montreal's Just For Laughs Comedy Festival and the inaugural Las Vegas Comedy Festival. He returned to the Montreal festival in 2007, where he was given the rare chance to perform a ten-night solo run, and that year he also embarked on his first major tour of Australia, with 94 dates. He now spends half the year in Australia. We do not currently hold contact details for Danny Bhoy's agent. If you are a comic or agent wanting your details to appear on Chortle, click here.